Ray Wall has been perfecting Margaritas for over 30 years and is recognized in the area for bringing "high end" Margaritas into the area back in the 80's! He is credited with being the originator of the famous "Margarita Loco." NEW - Hudson Valley Magazine has awarded Jose Malone's another Best Margarita award - this time for the whole Hudson Valley!! 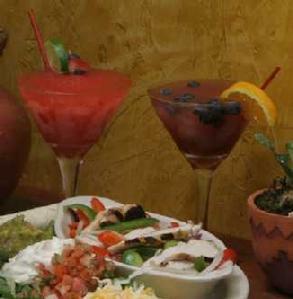 Metroland Magazine (The Capital Region's arts and entertainment weekly) has declared Jose Malone's Margaritas the "BEST MARGARITA" in the Capital Region in their recent Best Of 2007 issue!!! We have recently received notification of another BEST MARGARITA which we can't reveal until the magazines October issue comes out in October '07! Ray Wall's Margarita reipes recently won both 2nd and 3rd place in a reader's poll for a regional magazine (May 2007) for BEST MARGARITA! It's really quite simple however, use a good tequila, a good triple sec, and use fresh squeezed limes! Never any sour mix. Our "premium" margaritas use either Patron Cintronge or Cointreau for triple sec and there is over 45 100% agave tequilas (we are constantly adding more) to choose from - and squeezing limes is just a pure joy. Our "house" margarita uses Cuervo Gold, the best "mixto" available. A popular trend for Margaritas is to add fruit flavors. Jose Malone's has a variety of fruit flavors to add to our Margaritas. Pictured above are two of our fruit flavored Frozen Margaritas. Warning: our Margaritas are cocktails, NOT kiddie drinks (with 60 ounces of cheap sour mix to try to impress you) - this is the real thing! Sip them, enjoy the mix of flavors and of course - drink responsibly.